1. Start the coals or heat a gas grill for direct cooking (the fire should be medium heat). Make sure the grates are clean. 4. Put the jalapeños on the grill directly over the fire. Close the lid and cook, carefully turning once, until the peppers have softened and browned (it’s okay if they char in spots) and the cheese has melted, 5 to 10 minutes. Transfer to a platter, sprinkle with cilantro, and serve. 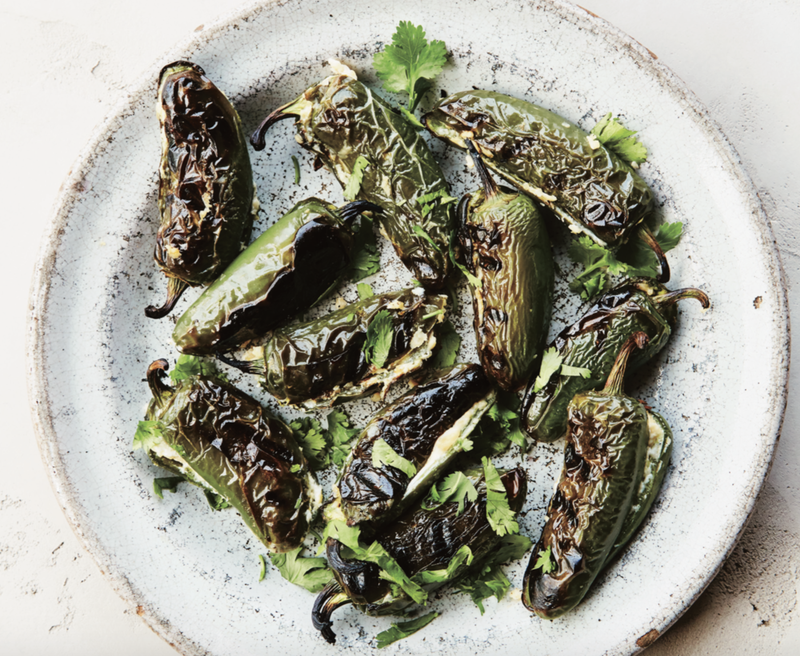 Tangy with a hint of sweet: In Step 3, fill the jalapeños with a mixture of 1 1 ⁄ 2 cups crumbled fresh goat cheese (6 ounces), 2 tablespoons honey, 1 tablespoon grated orange zest, and salt to taste. South by Southwest: In Step 3, fill the jalapeños with with a mixture of 1 cup grated extra-sharp cheddar cheese (4 ounces), 1 ⁄ 4 cup each chopped drained pimentos and mayonnaise, and a dash of Worcestershire sauce. Serve topped with a dab of pepper jelly. In Step 3, fill the jalapeños with a mixture of 1 1 ⁄ 2 cups shredded mozzarella (6 ounces) and 1 ⁄ 4 cup basil pesto. Serve the poppers topped with fresh basil leaves if you like.